A genuine alexandrite gemstone sits neatly in the middle of a cross in this plain real alexandrite cross necklace in 14K white gold from Apples of Gold Jewelry. The 1.75mm alexandrite gemstone is held in place in this women's cross pendant by 4 prongs in a prong setting, adding sparkle to the white gold. 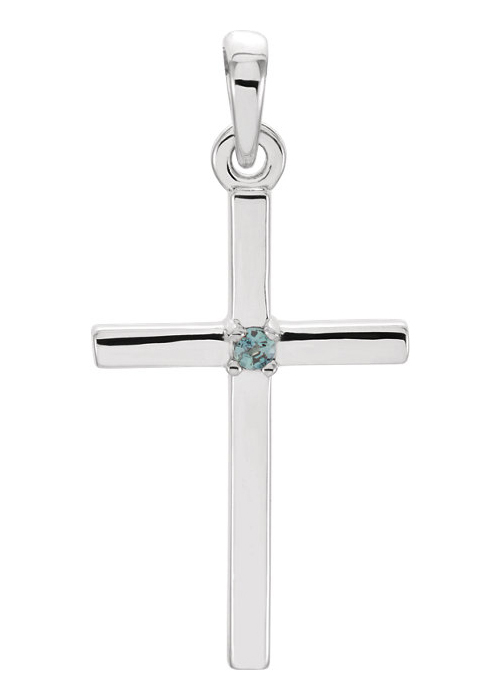 The A rated alexandrite stone adds plenty of elegance to this pendant, which is a plain and polished cross. The overall size of this beautiful and simple cross pendant is 1 inch in height and 1/2 inch in width. "For thou, LORD, wilt bless the righteous; with favour wilt thou compass him as with a shield. "(Psalms 5:12). We guarantee our Plain Real Alexandrite Cross Necklace, 14K White Gold to be high quality, authentic jewelry, as described above.